If you do volunteer you can get in and watch the bots fight for free! Also you will trade off with somebody else so you will not have to work the whole time. Mechwars is planning on having 50 to 100 robots being there to fight so if you go as a volunteer or spectator, you should have a lot of fun! Mechwars is going on May 19th (Saturday) and 20th (Sunday) 2007, in Minneapolis, Minnesota. Signup with the link below. Today RoboSavvy has hit its 1,000,000 visits mark! This count has been done over the last two years. I’m sure there will be many more visits to RoboSavvy in the next few years! RoboSavvy is the biggest online Robo-One community right now! Now Let’s Get The Party Started!!!!!! For those of you who did not watch the video it is of a Lipo (Lithium-Polymer) battery fire. Lipo batteries can be very dangerious. If you ask me, I’ll buy the Lipo bags if I use Lipo batteries. LipoSacks cost about $30 USD. Here is a video of the RT Corp. rabbit that is near the doors at RT Corp. in Akihabara electronics district of Tokyo, Japan. Mr. Torimoto is an origami expert and went against the SolidWorks CAD Robot to see which one could make a robot the fastest. The winner? Watch the video below to find out! One thing is for sure the SolidWorks Robot is a really powerful program. Also you can get a free origami robot kit with instructions by Mr. Torimoto sent to your email or your ‘real’ mail box if you are in the USA or Canada. 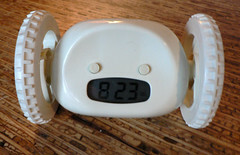 A few hours ago I got an email from Nanda saying that Clocky is now for sale. I have not been to her site for about 4 months so I have not been up on all the latest Clocky news. I went to her site and saw the latest pictures of Clocky…and…well…thay seemed kind of girly… and cute… NOT some thing you would want to be seen carrying around or even all taken apart on your work bench… maybe I’m wrong… you can see for yourself with the link below. Also, it didn’t seem like something you could hack. Tell us what you think about Clocky. I’ve had Robot Builders Sourcebook by Gordon McComb for about a year now, and still have not read the whole book yet. But that’s going to change in the next year, so by February 2008, I’m going to have read the whole book and followed every link! “Why would you ever do that when you can just look up different categories, like ‘fasteners’ and ‘power transmission’?” you ask. It’s so I can put up corrections and take out sites and stores that are no longer there. I’ll be posting mini reviews of sites and stores that I discover through this book, along with additional ones not mentioned in the book, on the Ribo-Labs link page. This way, everyone can benefit by it. You can help by emailing me through my contact form on Ribo-Labs.com or by putting a comment on this page. You can tell me about robot-related sites, stores, etc. that you know about.